You probably don’t know me. My name is Tess, and I am one of your many subscribers to your streaming service. In fact, I’ve been with you since before streaming was an option online, and you were just DVD only! Wow has the landscape changed since then, and you’ve paved the way for a new mode of viewing in the entertainment industry. I want to say thank you for your many innovations. I can remember when the “Watch Now” feature was in its infancy online. Now, you have thousands of options. Your platform has changed the culture and made things like a Saturday night-in become a standard. However, I want to address a few things with you. Today is October 3rd and consequently “Mean Girls Day.” The reason for this, as you know, came about over the past years because of the popular line in MEAN GIRLS that reads, “On October third, he [Aaron Samuels] asked me what day it was.” Twitter and pop-culture sites of the like now promote the movie and its cult classic moments throughout this day every year. I want you to know that I prepared myself for the plethora of memes and comments about #MeanGirlsDay, but I was quite surprised when I saw the following tweet from you…. Mean Girls Day is undeniably more culturally significant than many federally-recognized holidays such as Father’s Day and Your Birthday and should thus be allowed to officially replace one in the national calendar of record. I had to re-read this a few times to understand what you were saying. On one hand, you’re right, something like #MeanGirlsDay is a pop-culture phenomenon. I get that you’re being satirical but after viewing this tweet, which will reach thousands upon thousands of Twitter users, I felt the need to use this as an opportunity to reach out with some things on my mind. Every-single-day, I report on media news. A lot of times, I enjoy it. There’s usually something going on that prompts excitement but then there are other times where I feel my stomach drop. I’m sorry to say, but in recent months, you have been the source of many of those feelings. Your Netflix Originals like INSATIABLE, THE BREAK WITH MICHELLE WOLF, 13 REASONS WHY, and CHILLING ADVENTURES OF SABRINA came across my computer screen more than once. All of these series directly blaspheme my beliefs in Jesus, the blessing of giving life and manipulate the evils of the devil to seem normal. I can’t help but feel these projects target Christians and are downright inappropriate and destructive. A few weeks ago, a team at Movieguide® did some research on your show’s ratings. We found that 61% of your original programming isn’t family friendly. 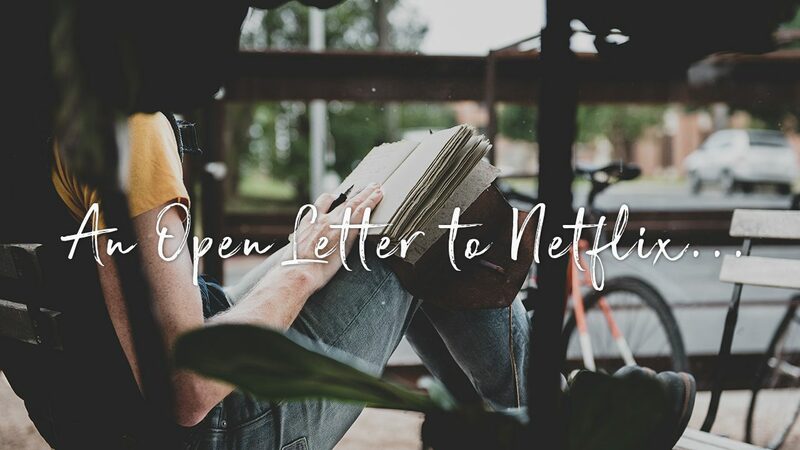 In the recent past, I’ve seen higher-ups at Netflix say that you want to have more faith-centered and family content online for subscribers. Of course, that will take time but Netflix, I implore you, I beg you, to put your money where your mouth is. You may think that the Christian or family audience isn’t worth catering to but let me tell you why that’s false. Did you know that on average American’s spend 5,179 hours or more each year consuming media? If you aren’t providing content that speaks to good values and instead have programming that splatters the image of Jesus or the church, you run the risk of losing tens of millions of families. When we asked our own audience, we found that 30% of families chose to cancel their subscription. With other family-friendly streaming sites like Pure Flix, and potentially Apple and Disney’s streaming sites coming soon, this is not a risk you can take anymore. Also, today, you released news that you will be making many projects based on The Chronicles of Narnia. When I heard the news, I thought this is a great idea! Yet, because of your recent track record, I’m scared for you. If done wrong, you will alienate even further a huge audience that’s familiar with the beloved books by the Christian author C.S. Lewis. Please know that I am praying for your success. I want to encourage you to gather the best programming for your subscribers. Just as Jesus, the savior of the world did when He came to earth, I hope to exercise kindness towards you (Titus 3:4) and respect your mission of providing worthwhile programming. When I write for Movieguide®, I want to give readers good news about programs they can expect, instead of a constant barrage of negativity. With all that being said, please maintain a healthy caution moving forward. Know that your reach impacts millions worldwide. This important audience comes with a great responsibility, I just hope and pray you’ll treat us, and our values and beliefs with the respect and dignity we deserve.